Will A World Of Driverless Cars Be Heaven Or Hell? The Atlantic Cities: Will a World of Driverless Cars Be Heaven or Hell? When my city-raised son was two, he’d scream bus! with full-bodied delight whenever he saw one. It’s quite possible that his yet-to-be-conceived youngest child won’t learn that word, nor ever ride in a “taxi,” “shuttle,” or “vanpool.” These fine gradations for types of shared vehicles will disappear much liketelephone booths from city streets — and not to be replaced by the likes of Zipcar, Car2go, or Lyft. Rather, it is the fully autonomous car that is going to be game-changing. But it is a future with two trajectories: heaven and hell. Let’s start with the hell scenario, in which we all own driverless cars that do all our errands for us. To see the impact of our worst nature, consider a typical day owning an autonomous car. I have a breakfast meeting in Harvard Square, so my fully autonomous vehicle — my FAV — drops me off then sends itself back home to park for free. I schedule the FAV to return at 9:30 a.m., but I don’t rush out because the car will just circle the neighborhood until I tell it “I’m here!” Later on, my son decides to go to a friend’s house two miles away, but instead of riding his bike the family FAV takes him there and comes back. As I get a friend a gift at a hand-made jewelry shop, my FAV circles the block for 15 minutes. Rather than trip-chaining to get the dry cleaning, we send the FAV out anytime to pick it up (an employee places the cleaned and pressed clothes in my car for me). Ditto for our take-out dinner. How getting from here to there is changing forever. Here’s why that’s a hellish vision: people consider the cost of individual car trips to be just the cost of gas and we won’t think twice about asking a driverless robot car to do our bidding. In a FAV world, where we won’t actually need to be doing the driving ourselves, each and every errand whim we might dream of is now a reality. If single-occupancy vehicles are the bane of our congested highways and cities right now, imagine the congestion when we pour in unfettered zero-occupancy vehicles. Now for the transportation heaven scenario, in which shared FAVs are used for on-demand origin-to-destination public transport. Depending on the weather and our moods, both my son and I can choose to ride our bikes to our destinations, which is also door-to-door and basically free. Or we use an app to call the public (or private?) shared FAV and tell it “I’m here and I want to go here.” We wait less than two minutes and a six-seat vehicle arrives. There may or may not be people in it already, and we may or may not stop and pick someone else up along the way. If I didn’t want any side stops and were rich enough to pay a surcharge, I could say, “I’m here. Book entire vehicle.” I might also say “I’m here. Book entire vehicle. Fancy one, please.” With the shared FAV world, I have a full range of luxury and price points, and society has fewer individual car owners. The subway will still be an attractive mode of transport: no traffic, no traffic lights, with a hard-to-beat passenger throughput in the most dense geographies. The price point of shared FAVs will be comparable to current public transit fares, but likely won’t require taxpayer subsidies. It should be profitable in most densities, and maybe some clever price manipulation (pushing people to cluster the timing of their demands) could even make it work in rural areas. We still walk, bike, and perhaps even own motorized single-person vehicles. But when you need a car, nothing will beat the convenience and price of the shared FAV, with its real-time, 24/7 access, pay-only-for-what-you-use, get-the-exact-vehicle-you-want, never-ever-have-to-park-it, never-have-to-maintain-it ease of use. While the hell vision results in gridlock everywhere, this heaven vision takes all those personal cars — now parked 95 percent of the time — off the streets and out of garages. We can repurpose those lanes to trees, bike lanes, sidewalks, play spaces, bike parking, café expansion, community gardens, or even swimming pools. It’s not too early to consider this alternative universe. Autonomous cars will be part of our reality faster than most people realize. 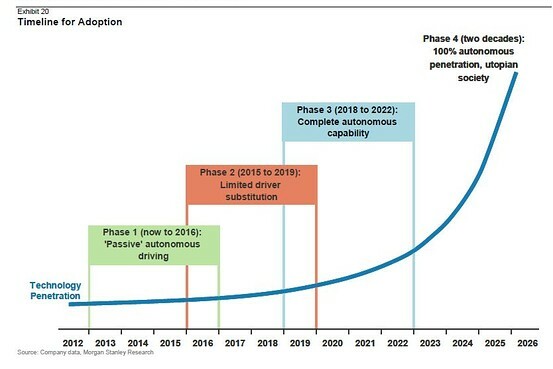 While manufacturers have afour-phase plan to bring about the fully autonomous car within the next two decades, Google promises to have them ready as early as 2017, just three years distant. My guess is that Google’s could be the “heaven” vision. In July they spent $966 million to purchase Waze, a company with a brilliant smart phone navigation app. The app delivers the best routes based on the historical choices of the 50 million Wazers combined with the traffic speeds they are experiencing in real-time. Back in the day, when I was CEO of Zipcar, I was struck that we knew the precise times, days, durations, and distances of car travel more intimately even than car manufacturers did. Today, Waze offers a greater insight into the exact travel paths of what must be on the order of a billion trips over many years. If you wanted to get into the on-demand public transport world, you couldn’t ask for better data against which to understand and predict exactly where and when people will want to travel. Couple that with Google Ventures single largest investment to date — $258 million — into Uber, which has perfected the request, pickup, and delivery side of the equation, and you’ve got a clear blueprint for tomorrow’s transportation (if you take as a given the autonomous vehicle itself, of course). But getting to the heaven vision will also require making sure that we share not just the cars (about 80 percent of all trips are single occupancy, and this produces a lot of congestion), but we also share the trips, which is where the real road efficiency will come from. Having a range of vehicle types and sizes, pricing the trips appropriately, and making sure that all of them are CO2-free are all necessary parts of a heavenly car future. So policy makers, taxpayers, road warriors, city lovers: Which path forward will we choose? Our future hinges on two things. First, will the cost for autonomous vehicles be high enough that each vehicle will need to be used well? If so, the economic imperative to share the cars will set us down the efficient-use path. Second, will we add a per-mile fee for human-free passenger vehicles? We will need that to temper our insatiable desire to send machines out to do our bidding.